People die, I think, but your relationship with them doesn’t. It continues and is ever-changing. Jandy Nelson’s I’ll Give You the Sun — this year’s Printz Award winner — is about a pair of twins, Noah and Jude. The two are incredibly close until the year they’re thirteen. Jude is popular and outgoing, while Noah tends to keep to himself; however, their surface-level differences don’t get in the way of what they have in common, or of their profound understanding of each other. Noah draws and impresses everyone with his talent, while Jude makes mesmerizing sand sculptures. They visit museums with their art historian mother and are busy preparing their applications to art school. As with most siblings, their relationship is complicated and touched by occasional rivalries, but they’re safe in the knowledge they’re the most important person in each other’s world. Until, that is, a chain of painful events drive them apart, and the twins are left to struggle on their own. I’ll Give You The Sun moves backwards and forwards in time: the story of what happens the year they’re thirteen is told from Noah’s point of view, while Jude narrates events three years later, when she and her brother barely speak and their lives are unrecognizable. As we learn more about their lives — about Noah’s romance with his new neighbour Brian, about Jude’s creative impulse and the new boy in her life, about why Noah never draws anymore, and about the hidden side of the twins’ mother’s life — we begin to piece events together. And little by little, so do Noah and Jude: it’s only by breaking free of their isolation that they’re able to rethink their understanding of the past, and, as a result, to remake their present-day world. First of all, I’m thrilled that I’ll Give You The Sun won the Printz. It’s a beautifully written, thoughtful and moving novel, full of complex emotional truths, big ideas, and well-drawn characters. I have to confess, though, that I very nearly gave up on it fairly early on. It was only the fact that it came highly recommended by people I trust that kept me going, which I’m very grateful for. The reason why I was put off is that the early chapters seem to prop up a tiresome false dichotomy between creative people who embrace the richness and the mystery of the universe and dull-minded scientists who want to oversimplify everything. This never fails to make me sigh in exasperation, and also long to break out my beloved Feynman flower video. However, eventually it becomes clear that this is not a novel where things are necessarily what they seem, or where caricatures are allowed to stand. The twins’ artistic mother and scientist father are gradually fleshed out, and readers are given a glimpse of the growing distance between them, of the reasons why they became less than patient and generous with each other, and of how this affected their children’s account of events. Who knows if destiny is just how you tell yourself the story of your life? Another son might not have heard his mother’s last words as a prophecy but as drug-induced gibberish, forgotten soon after. Another girl might not have told herself a love story about a drawing her brother made. Who knows if Grandma really thought the first daffodils of spring were lucky or if she just wanted to go on walks with me through the woods? Who knows if she even believed in her bible at all or if she just preferred a world where hope and creativity and faith trump reason? Who knows if there was ghosts (sorry, Grandma) or just the breathing, living memories of your loved ones inside you, speaking to you, trying to get your attention by any means necessary? Who knows where the hell Ralph is? (Sorry, Oscar.) No one knows. So we grapple with the mysteries, each in our own way. The big event that shakes up the twins’ lives is revealed less than a third of the way into the novel, so I have a hard time thinking of it as a big spoiler. The revelations in I’ll Give You the Sun are more subtle than that — they have to do with the characters’ emotional realities; with how they experience events whose plain facts we already know. Nevertheless, I understand that some readers might prefer not to know anything about what’s coming, so consider this a spoilers warning: I’ll talk openly about plot details from this point onwards. Another thing I’ll Give You the Sun is about is how death abruptly cuts you off from people, but that doesn’t mean your relationship with them doesn’t remain living and evolving for as long as you yourself are still alive. Jude slowly comes to this realisation — as she herself grows and changes, and as the facts she uncovers about the final months of her mother’s life reshape her understanding of her, her love for her is also reshaped. Finding her way back to that “continuous and ever-changing” love is essential for Jude. When her mother dies, Jude feels cut off from her when she needed her the most — in the wake of a sexual assault. But although there’s no way around the finality of death, or the life-long reality of her mother’s absence, that doesn’t mean Jude can’t continue to find meaning and comfort in the bond the two shared. I let it. I let my heart break. And Noah is there, strong and sturdy, to catch me, to hold me through it, to make sure I’m safe. Noah and Jude’s deep and complicated love for each other is at the heart of I’ll Give You the Sun. I was talking to a friend about the novel, and she said the richness of these twins’ relationship caused Ben and Hazel from The Darkest Part of the Forest to pale in comparison, even though that’s also a very good novel. I’m glad I didn’t meet Noah and Jude first, or else I strongly suspect that what happened to my friend would have happened to me too. There’s just something about Nelson’s writing that really makes her characters’ love and its many complications come to life. It was especially moving to note how Noah and Jude shy away from each other because in the wake of their mother’s loss, their love scares them. They’re terrified by the vulnerability of it; by the fact that it’s more than they could bear to lose. It’s such a human reaction, even though closing yourself off doesn’t really help anything or anyone in the end, and it was so great to find a story that gets that right. As the story progresses, the twins learn to once again read each other’s actions generously; to default to trust and to love. They slowly go back to giving each other the benefit of the doubt; they forgive past hurts; they come to terms with the human imperfections of their love; they accept they both made mistakes but were genuinely doing their best. Their reconciliation feels genuine because I’ll Give You The Sun acknowledges that it can be immensely hard for people to find their way back to each other, even when they never stopped caring. But hard is not the same as impossible, and it was wonderful to see Noah and Jude get there in the end. 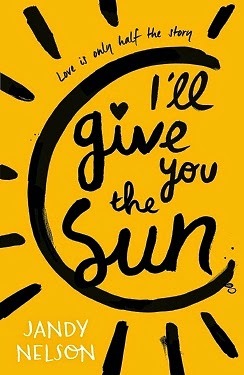 I’ll Give You the Sun is also about creativity and how it helps us construct meaning, about how our life stories contain infinite angles and accommodate multiple truths, and about how art can be a way to express them. I particularly appreciated that the twins’ mother was never demonised, even though that’s often the case for women who leave their marriages. She was a person with her own life, she loved her children, and she fell in love with another man. Much like One Crazy Summer, I’ll Give You the Sun gives her space to be a human being as well as a mother, it gives Noah and Jude space to be upset, and it acknowledges that situations where people get hurt don’t require a bad guy. Hearts are fragile and get bruised even when people do their best, but patience and love get us through the rough patches. They read it too: Rhapsody in Books, Chachic’s Book Nook, Shiny New Books, you? All I knew about this book before reading your post was that it won the Printz and that Chris loved it. Either of those was certainly enough to make me want to read it. But wow. Having read this beautiful post, and hearing how much you love it, I know that I must get my hands on it immediately. It sounds wonderful! I am like Memory, good sibling relationships in a book are catnip for me. Wonder if my mum would like this or if she would find it too sad... It seems like the kind of book she would buy and read first and then I would borrow it from her. These are seriously some of the best siblings I've ever come across. Not to raise your expectations or anything :P Anyway, I hope you and Mumsy enjoy it if you pick it up! I'd say it's bittersweet more than sad - there are heartbreaking moments, but it wasn't a story that left me feeling down (quite the opposite). PS I checked this out of the library, read ten pages, and thought "Mumsy would love this." So I brought over my library copy to lend to her, and she read half of it and decided to buy it. I'm psychic, is basically what I'm telling you.